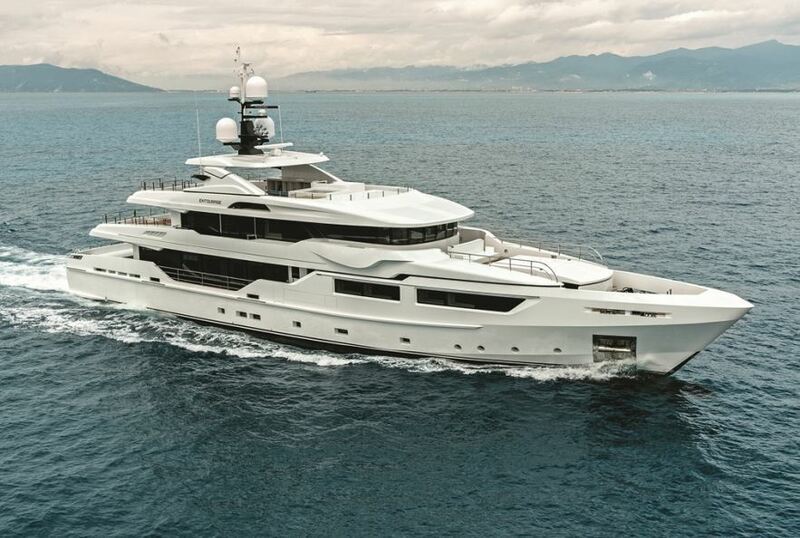 Award-Winning 46m Motor Yacht ENTOURAGE now Available for Caribbean Yacht Vacations – Superyachts News, Luxury Yachts, Charter & Yachts for Sale. The award-winning 46,55-metre motor yacht ENTOURAGE is now available for Caribbean yacht vacations following her very successful Mediterranean charter season. Join Captain Ben and his outstanding crew of eight highly-professional and skilled members on a holiday of your dreams on board the 2014 Admiral Yachts-constructed charter yacht ENTOURAGE. Entourage is also available for Christmas and New Years yacht charters in pure luxury and style. ENTOURAGE was delivered only a year ago and is still in a brand-new condition, offering spacious interior and exterior leisure and entertainment areas, with an expansive main-deck master suite, spreading the width of the yacht and offering such commodities as a private shower room, dressing and office/seating area. Fitness conscientious guests will surely enjoy the benefits of an on-board gymnasium, as well as the health benefits of the Turkish steam room, located on the main deck. Guest accommodation layout comprises two beautiful VIP and two convertible double rooms situated on the lower deck. All guests accommodation is equipped with private en suite bathrooms. Guests holidaying aboard the fabulous ENTOURAGE yacht will find the 134-square-metre sun deck as the place to enjoy some leisure sunbathing, socialising or relaxing in the popular Jacuzzi. The sun deck also has a TV and a wet bar, as well as a massive selection of sun pads and beds. Luxury yacht ENTOURAGE holds a variety of water toys and equipment to further enhance guests’ on-board experience. The boat holds a large 31ft tender, jet skis, sea bobs, kayaks, bikes and other equipment. Guests comfort is ensured thanks to ENTOURAGE’s zero-speed and at-anchor stabilisers, exceptional WiFi and an economical fuel consumption. Caribbean is renowned for being one of the preferred yacht charter destinations and a fabulous escape during the cold winter months. The Caribbean Sea is full of fabulous destinations to explore and enjoy, including Antigua, St Bats, Anguilla, St Martin, the British Virgin Islands or the US Virgin Islands, Grenadines, St Lucia, St Thomas, Martinique and many many more. Sailing and motor yacht holidays in the Caribbean can be fully customised incorporating any activities, stopovers or events that you might like to take part in. It is a great destination for all types of yacht charter, be it a family holiday, a getaway with friends or a corporate get-together with your partners or colleagues. Caribbean offers both tranquil natural surrounding with crystal clear warm waters, great diving, fantastic sailing and fabulous grounds for various water sports, as well as plenty of bars, restaurants, night-clubs creating a lively and vibrant atmosphere.